The political tsunami generated by Brett Murray’s painting The Spear has begun to subside, so there is some relative calm in which to assess the consequences of the painting and the outcry. 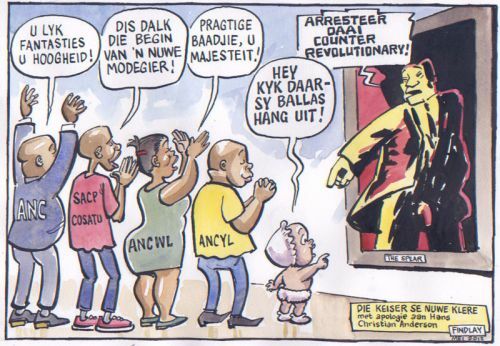 The core of the complaint, as developed by the ANC, was that the painting denigrated the leader of the country, assailing particularly his rights to privacy and dignity. In doing so, it attacked black male sexuality, reproduced the apartheid stereotype of the lustful, uncontrolled black man, and mocked the value of polygamy, thereby revealing a gross insensitivity to African values. At a more foundational level, a painting of this nature by a white artist called back the manner in which “white” values are employed to define black conduct and culture, thereby reminding the nation at large of the pain and destruction caused by an evil system which defined black South Africans as the “lesser other”. The defenders of the painting, at the simplest level, called into support the constitutional right of freedom of expression in general and freedom of artistic creativity in particular. Thus they argued that, although the value of dignity must protect the self-worth and the public estimation of the individual, the balance struck between the right of expression and the rights to privacy and dignity can only achieve the protection of the legitimate interests of the individual. As the president, Jacob Zuma does not have a legitimate interest in being protected against vigorous and even vicious criticism of his political conduct or personal behaviour, the latter being already, and legitimately so, in the public domain. At a deeper level, the defenders warn about the painting being employed as an attack on modernity, on its replacement with a conservative, patriarchal vision of South African society buttressed by certain evangelical religious strains. So how to make sense of all this deeply divisive debate? If we were not aware of it before the painting became the subject of the national debate, we have finally had the rainbow myth stripped way: we remain a deeply divided society. The horrendous consequences of apartheid remain, nearly 20 years of democracy notwithstanding. The arrogance of the majority of whites (who, like their old leader FW de Klerk’s amnesia about the sustained oppression that was separate development) prevents a paradigm shift in public discourse towards a true understanding of the destruction, both physical and psychological, caused by decades of racism. And, even once white South Africans have grasped that pressing insight, there is the challenge of ensuring that this percolates through the engagement. For example, the interaction between the Bench and Gcina Malindi SC was not out of the ordinary: the judges were certainly entitled to probe all the issues they raised with Zuma’s counsel. But, no doubt inadvertently, and to remove the race connotation from the dispute about the painting, when it was suggested to Malindi that he was performing with great eloquence and skill, many read this as equivalent to saying: “You are performing like a white silk.” A reasonable South African watching the interchange would, if fairness was her standard, have known that was never the intention of the judge. But it would, given our history, have been legitimate for Malindi to have perceived it as such. At the same time, the line of reaction developed with such success by the ANC poses a threat to continued critical deliberation in this country. Acerbic, satirical, vigorous criticism of a leader of the ruling party can so easily be framed in the same terms – as an assault on core national values, on “all of us in the majority” or, more dangerously, on the project to develop a concept of African modernity. Take customary law. The constitutional design was not to destroy or replace this body of law, which is so much a part of the African heritage and governance. Rather, the objective was to transform this code of law, like all other law, to become congruent with the Constitution. Thus institutions such as patriarchal rule or polygamy require change to ensure compatibility with the core values contained in the Constitution. The recent attacks on so-called elite values and the resurgence of unbridled or unreconstructed African ­traditions can well lead to the idea that equality, particularly antidiscrimination on gender grounds or in respect of sexual orientation, or the generous protection of expression (which includes holding leaders accountable for their conduct and performance) is no more than a form of Western neocolonialism. A careful examination of the arguments attacking The Spear leads in that direction. The charge of elitism then becomes the basis on which to censure any form of conduct that relies on the Constitution but which is directed at government corruption – and to disregard those sections of society that enjoy constitutional protection, including the currently disadvantaged, who are overwhelmingly black South Africans. If that is where this controversy leads, it would not only imperil the Constitution but also to the very idea of the transformed society envisaged in that document – a document that, ironically, the ANC fought for so long and courageously to implement.